Finally, I am excited to share the graphic I created for Work/Life 3: the UPPERCASE directory of illustration. I have been following and subscribing to UPPERCASE magazine for a while now and when I saw a call for entries to their latest edition of the Work/Life series, I decided to apply. I don't actually consider myself an illustrator but I was drawn to the theme of this book which is: an illustrated life. I love hearing about other artists and designers' lives and how they stay inspired and creative and I thought this would be a fantastic opportunity to challenge myself and share my little story with the world. 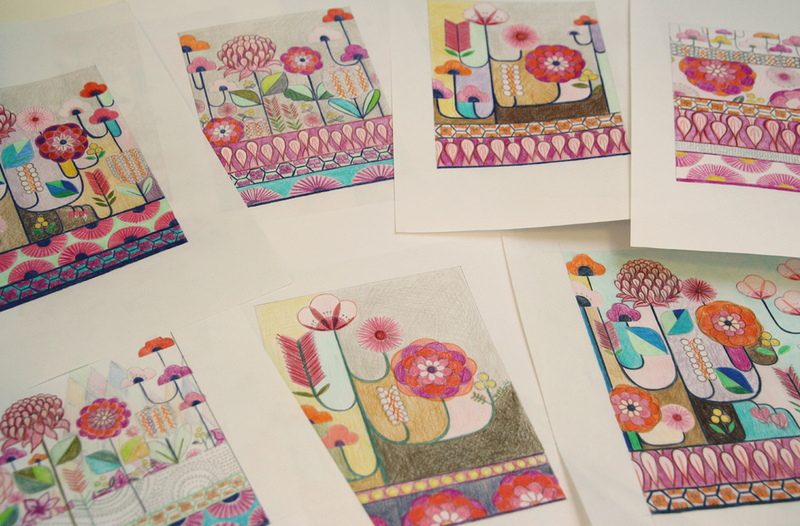 I was genuinely surprised to hear from the publisher/editor/designer of UPPERCASE, Janine Vangool, who asked me a few more questions about my reasons for applying for this and what experience I had with commissioned illustration work and working in a digital format. I was pretty sure that was where my application would end but in the early hours one morning Adelaide time, I received an email from Janine welcoming me to the project. I was so excited and nervous all at the same time. Work/Life 3 is a directory of 100 illustrators from all over the world. Each participant was first interviewed about their life and practice and then given an individual assignment. 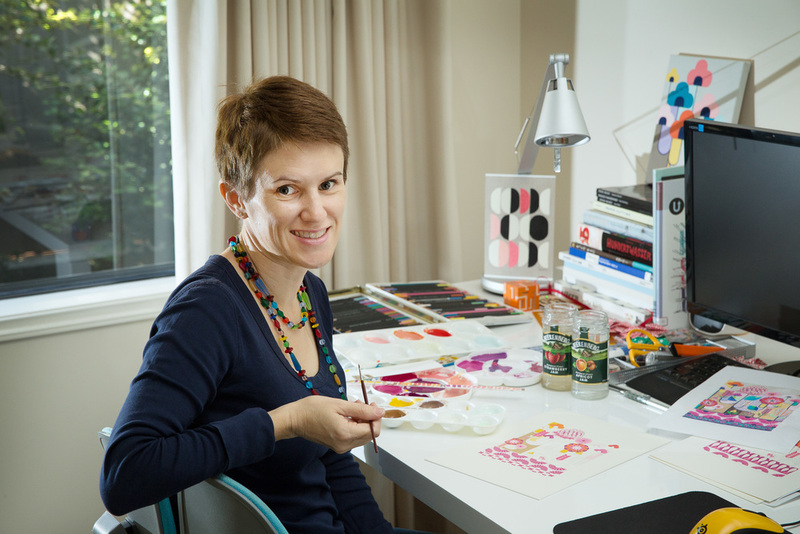 My assignment was to create a colourful pattern design or graphic that contains inspiration from both Australia and Japan. I loved the assignment but it was also such a broad and huge area of inspiration that I had to narrow it to something I could manage. I turned to my love of flowers and began to think about flowers and plants that I had seen while living in Japan and combine them with native Australian flowers. I had about 5 weeks to complete the assignment and I basically went into hibernation for all of April as I worked away every evening on coming up with ideas and developing these initial sketches into the final design. Some of the imagery I used was very obvious such as the blossoms from Japan and the wattle from Australia but other things were more subtle like one of the flowers I remember seeing on my walks in Japan or some of the edge patterns I created which reminded me of some of the edge designs that you see on tatami mats in Japanese houses. I probably found it harder to fulfill the Australian side of the brief but similarly I looked to the ordinary native plants in our area, the bottlebrush and eucalyptus flowers and bright pink native ground cover that I used in semi-circles down the bottom to reference Japanese fans as well. I worked on several variations around these initial ideas and probably had the most fun when I started to think about colour. 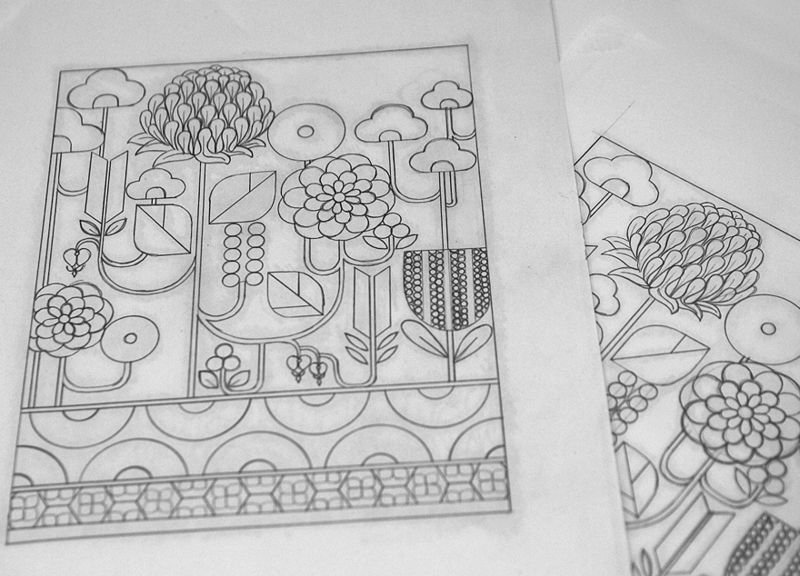 Eventually, I decided the final outline of the graphic I would use and began to paint in gouache the final design. Although I knew that I would be submitting the final design in a digital format which meant I could make any corrections using a digital pen, I wanted highlight the handpainted nature of the work and didn't want to make any mistakes. So initially I began painting 3 final pieces at the same time with the idea that I would choose my favourite colours and patterns at the end. As the deadline for submission drew closer, I had to abandon two of the paintings and concentrate on finishing one. In the end I used the image almost exactly how it was hand painted although I decided to re-paint a couple of sections to simplify the flowers and then I cut and paste these digitally to the final image. Part of the submission requirements were to send images of your workspace, yourself and or things that inspired you. I owe a huge thanks and credit to my husband, Hiro, for taking these images, some of which were used in the book. I channeled all my creative energy into this project and I was really happy with the final result which I think is a good representation of my style, myself and the way I like to work. I decided to call this piece, 'International Marriage' because it combines inspiration from both Japan and Australia and also reflects my own life as I see the beauty in being married to someone from another culture. I really enjoyed every part of making this contribution to the Work/Life 3 directory and what I loved most about it is the realisation that even having to stay up late every night to work on this, even working on all the tedious and time consuming parts, even when your hands hurt and your eyes get blurry, this is what makes me happy and this is what I love to do. Work/Life 3: the UPPERCASE directory of illustration is now published and I am eagerly awaiting my little copy to arrive downunder.